Pixels could very well be the most unremarkable Hollywood film of the year, says Paloma Sharma. Have you ever wondered what would happen if old video games came to life, tried to destroy the world and Adam Sandler was the only one who could save us? No, neither has anybody else because what a nightmare -- primarily because of its terrifyingly boring nature -- it would be. Secondly, expecting Sandler, who's consistently played a goofball in several romantic comedies, to pick up a gun that shoots light and prevent apocalypse is stretching it a little too far. Pixels opens in 1982, when arcade games were a thing, when NASA has the brilliant idea of recording one arcade game championship on video and sending it into space as part of a time capsule. During said championship, Sam Brenner competes with Eddie Plant (whose grown up version is Peter Dinklage) during a tie-breaking round of Donkey Kong. Brenner loses to Plant and although his best friend Will Cooper tries to cheer him up, he develops a lifelong aversion to the game. Years later, Cooper (Kevin James, a far cry from his usually endearing screen characters) manages to become the President of the United States, despite having questionable reading skills (did anybody say, Bush?) while Brenner (Sandler) works for a tech installation company. They're still best friends though and Brenner hangs out at the White House all the time. When the American military base in Guam is attacked, Brenner, Cooper and their socially awkward, conspiracy theory-obsessed childhood friend Ludlow Lamonsoff realise that the time capsule from 1982 has been intercepted by aliens, who have mistaken it for a threat. The aliens challenge Earth in a best of three battle of video games where the winner will take over the loser's planet; and since Earth has been challenged, of course it is the Americans who will save us. To be fair though, the film does feature other countries, including India. A young Indian couple that speaks horrible Hindi, is shown taking a romantic stroll near (surprise, surprise!) the Taj Mahal. Our erstwhile colonial masters make an appearance as well. Well, at least Sean Bean does, as a high ranking military official who plays host to the US military when England is about to be attacked by the alien life forms. One wonders what the British army has to say about that. It is abundantly clear that Pixels was essentially manufactured, and I say manufactured because it looks like an assembly line product designed especially as a nostalgia vehicle for the arcade game generation. For those who haven't had that experience, it becomes increasingly difficult to relate to the film. Not only is the script sloppy and predictable, it fails to provide backstory for anyone but the four male protagonists. Even for them, their character arcs are in shambles. I would say that Pixels treats its female characters as second class citizens, giving its actresses Michelle Monaghan and Jane Krakowski little material to work with, but I think that kind of sexism has become a mainstay of Adam Sandler films. Sandler, whose comedic style centers around him being as crass as humanly possible (and he is funny at times, no doubt), finds himself restricted by Pixels' desperate desire to be a family entertainer. 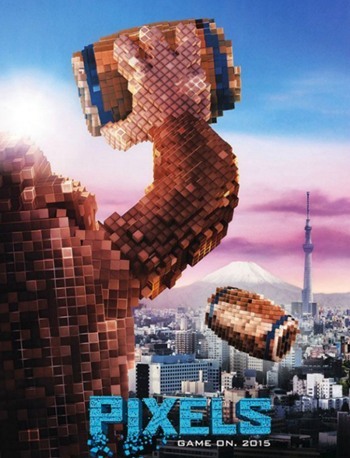 Pixels is devoid of standout performances and manages to pull even a talented actor like Dinklage (the stunningly sensational Tyrion Lannister of Game of Thrones) to its own level of mediocrity. The CGI in the film isn't top of the shelf either. Pixels tries your patience and offers no rewards for your persistence. It comes as a surprise that Chris Columbus, director of the first two Harry Potter films, could agree to be part of such rubbish. Exclusive excerpt from A P J Abdul Kalam's latest book!